Following from a previous post 10 Things to know about the Power of the Heart this video from the HeartMath Institute provides a very well visualised description of heart coherence. Coherence plays an important role in helping the body to regain homeostatic balance especially when under pressure due to stress and/or anxiety. Complementary therapists welcome the research of institutions such as HeartMath as coherence is also an important part of energy therapy and the visuals here depict the world of energy medicine very nicely. The Spiritual Heart — is in a way a little like a smart phone, invisibly connecting us to a large network of information. It is through an unseen energy that the heart emits that humans are profoundly connected to all living things. The energy of the heart literally links us to each other. Every person’s heart contributes to a ‘collective field environment.’ This short video explains the importance of this connection and how we each add to this collective energy field. The energetic field of the heart even connects us with the earth itself. The HeartMath Institute (http://www.heartmath.org) is helping provide a more comprehensive picture of this connection between all living things through a special science-based project called the Global Coherence Initiative (http:///www.heartmath.org/gci.) They hope to help explain the mysteries of this connection between people and the earth…and even the sun. 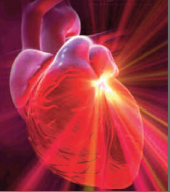 Scientists at the HeartMath Institute (HMI) have already conducted extensive research on the power of heart, the heart/brain connection, heart intelligence and practical intuition. Whether personal relationships, social connections, or even the global community – we are all connected through a field of electromagnetic energy. Increasing individual awareness of what we bring to this field environment could be the key to creating a sustainable future, a future that we can be proud to have helped create. To learn more about this research please visit https://www.heartmath.org/about-us/vi&#8230;. 1. Your heart emits electromagnetic fields that change according to your emotions. 2. The heart is 500 times electrically stronger than the brain and up to 5000 times magnetically stronger. 3. The human heart’s magnetic field can be measured up to several feet away from the body. 4. The heart has a system of neurons that have both short and long term memory. 5. That signals sent to the brain by the heart neurons can affect emotional experiences. 6. The heart send more information to the brain than the brain sends to the heart. 7. The electromagnetic signal produced by your heart is registered in the brain waves of people around you. 8. In the womb, the heart forms and starts to beat before the brain is developed. 9. A mother’s brainwaves can synchronize to her her baby’s heartbeats.